If you are pregnant or a new mom, you have likely heard about peanut allergies. It seems that peanut allergies have been cropping up in children all over the United States. Recent data shows that the number of children with peanut allergies has risen 21% since 2010. Why are peanut allergies so much more common today? The cause for this modern trend is largely unknown. One theory for the increased frequency of these allergies is that the methods used to process peanuts (roasting) makes it easier for your immune system to attack the protein found in peanuts. Another theory suggests that modern medicines (antibiotics) have enabled us to easily fight off infections that our immune system would have otherwise had to eliminate itself. This theory suggests that antibiotics leave our body’s immune system in a state that is more likely to attack harmless proteins, such as the proteins found in foods. Although the exact cause for peanut allergies is unknown, there may be some good news for babies at risk for developing peanut allergies. Some evidence has found that introducing peanut products at a young age to babies at high risk for peanut allergies may lower their chances of developing the allergy. Researchers first considered this possibility after noticing that Jewish children living in the United Kingdom had a 10 times higher likelihood of developing peanut allergies compared to Jewish children living in Israel. [3,4] Since the children’s ancestry were similar, there had to be another factor causing this difference. The researchers found that diet may have been the key. Children in the UK usually did not eat any peanut products during the first year of life, while children in Israel often consumed corn puffs made with peanut butter starting at around 7 months old. This finding led to the Learning Early About Peanut Allergy (LEAP) study to test this theory. The study identified children who were at a high risk for developing a peanut allergy and tested whether consumption of peanut products during the first 11 months of life reduced their chances of developing the allergy. The results showed a large decrease in the number of children who developed peanut allergies in those who consumed peanut products compared to those who did not. After the results of this study, the National Institute of Allergy and Infectious Diseases (NIAID) instituted new guidelines in 2017 that may reduce the chances that your baby will develop a peanut allergy. The guidelines divide babies into 3 categories based on the presence of eczema and/or an egg allergy. Each category has recommendations for when your baby should be introduced to peanut products and if he or she should be tested by your doctor for the presence of a peanut allergy. You can read more about the recommendations here. Before you give your baby any peanut products, always check with your doctor first. Although exclusive breastfeeding is recommended for the first 6 months of life, in some cases, your doctor may recommend introducing peanut products. Your doctor will determine the likelihood of your baby developing peanut allergies and whether your baby should be tested first to confirm if allergies are present. If your doctor recommends that you give your baby peanut products, it is important to follow the NIAID recommendations (listed below) and your doctor’s advice to safely introduce peanut products to your baby. The following recommendations are for babies with severe eczema or egg allergy whose doctor determined that it was safe to introduce peanut protein at home after an in-office allergy test. When introducing peanut products to your baby, you should always give the first peanut-containing meal at home, and not at day care or a restaurant. You should also make sure that there is at least one adult who can stay with your baby for at least 2 hours after feeding to monitor for any signs of an allergic reaction. It is important to be able to focus all your attention on your baby during that time and not be distracted by any other children or activities. When giving the first peanut-containing meal, give your baby only a small amount of the peanut serving on the tip of a spoon and then wait 10 minutes. Watch your baby for any potential signs of an allergy. The following describes some common symptoms to look for. If you notice any of these more severe symptoms, you should call 911. Your baby could be having a potentially life-threatening reaction, called anaphylaxis. If you notice mild symptoms, contact your doctor immediately. You should also contact your doctor if you notice that your baby has mild symptoms after about a week of eating peanut-containing foods. If, after waiting 10 minutes, you notice that your baby did not have an allergic reaction and is still feeling happy and energetic, you can gradually feed your baby the remaining peanut-containing serving. Whole nuts should never be fed to children under the age of 5 years, and unaltered peanut butter given on a spoon or in clumps should never be given to children under the age of 4 years. The following provides samples from the NIAID on how you can introduce peanut products to your baby. All the samples are for a serving of about 2 grams of peanut protein. Note: 1 teaspoon is roughly equivalent to 5 milliliters, and 1 tablespoon is about 15 milliliters. Option 1: Use 21 pieces of Bamba (or another peanut puff with comparable peanut protein content) and add 4 to 6 teaspoons of water until softened. Option 2: Use 2 teaspoons of smooth peanut butter and slowly mix in about 2 to 3 teaspoons of hot water. Stir the mixture until it is thin and well blended. Add more water if needed until it is a good consistency for your baby. Always let the mixture fully cool before giving it to your baby. Option 3: Use 2 teaspoons of smooth peanut butter and combine with 2 to 3 tablespoons of pureed fruit or vegetables. Mix until the 2 substances are well blended. Add more puree if needed until it is a good consistency for your baby. Option 4: Use 2 teaspoons of peanut flour or peanut butter powder and add 2 tablespoons of pureed fruit or vegetables. Mix until the 2 substances are well blended. Add more puree if needed until it is a good consistency for your baby. These new recommendations may provide hope to babies who have a high likelihood of developing peanut allergies. You can read about immunotherapy that may help children who already have food allergies here. Frellick M. Peanut Allergies Up 21%; Black Children Have Twice the Risk. Medscape. Hendrick B. Peanut Allergies in Kids on the Rise. Published May 14, 2010. Accessed December 23, 2017. 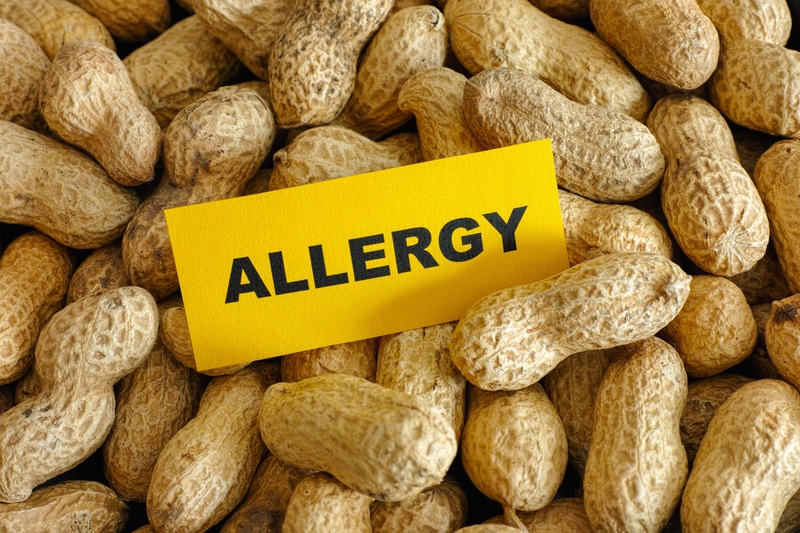 McCarthy C. Peanut Allergies: What You Should Know About the Latest Research & Guidelines. healthychildren.org. Du Toit G, Roberts G, Sayre PH, et al; LEAP Study Team. Randomized trial of peanut consumption in infants at risk for peanut allergy. N Engl J Med. 2015 Feb 26;372(9):803-13. Togias A, Cooper SF, Acebal ML, et al. Addendum guidelines for the prevention of peanut allergy in the United States: Report of the National Institute of Allergy and Infectious Diseases–sponsored expert panel. World Allergy Organ J. 2017; 10(1):1.